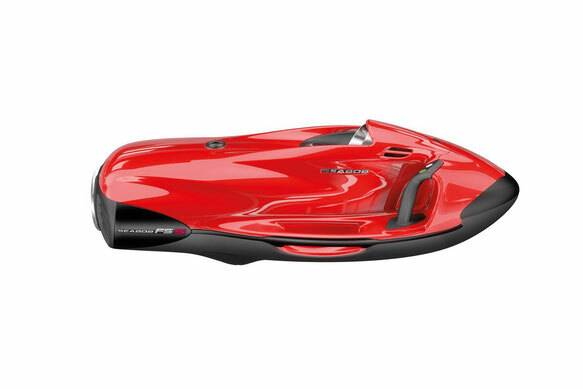 Cayago Seabob F5 S is a new generation underwater scooter! It is lightweight, easy to manage and has a very stylish design. Seabob is a great alternative to diving. It will allow fans of extreme sensations to try something new and unusual. Thanks to Seabob, even an inexperienced swimmer can feel comfortable and cozy in the water. The control is carried out by means of two smart handles with piezoelectric technology. Seabob has 6 different speeds. And to control them, there are special buttons that are responsible for switching them. If you press the green button, then the scooter will begin to accelerate smoothly, but if you press the red button, the scooter slows down. Two more buttons allow you to program an individual menu: the duration of the trip, the depth of the dive, and so on. Another huge advantage of this craft is that if you release the handles, the Seabob will not float away from you, but rather will hang up below you.